For seven generations, the Greybear Family has owned and operated The Bear & Ale around these parts. As one of the oldest inns in the area, it has known good times and bad ones, but has always opened its doors to welcome weary travelers. But something has happened to the Greybear Family and the inn has lost some cheer. The once boisterous owner, the burly Jarwald Greybear, now broods behind the bar… with just a hint of fear in his eyes. The 1st Official Neuroglyph Games Product Release is here… and it’s available to all absolutely FREE! 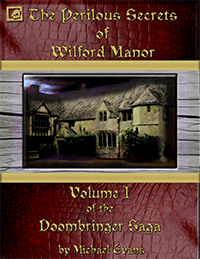 This adventure module is set for Characters Level 1-3 and can be used in any D&D 4e Campaign Setting. In A Curse at the Old Inn, your Heroes must survive a terrible onslaught from Beyond the Stars, battling to save not only their own lives, but the lives of the poor patrons trapped by a deadly curse. 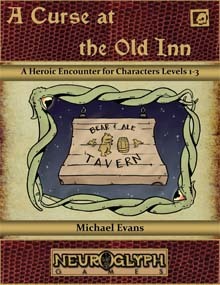 A Curse at the Old Inn is available for sale now from RPGNow and Paizo for Free Download! In your 4e module, “A Curse at the Old Inn” you list the stats of the door to the vestibule, on page 5, under Rules of Engagement as: AC/ Reflex 5; Fort 10; HP 25. What is the door’s AC or does the / indicate no armor class? @Lou – Inanimate objects typically have the same AC and Reflex. In the 4e DMG, the designers print it as AC/Reflex #. Hope that helps!